Last year, I wrote an article on Technet regarding the performance issues with the dynamic VHD file format. That article can be fund here . The main point made in the article was that the dynamic VHD file format ensured that 3 out of every 4 2MB data blocks were misaligned in the sense that they did not begin on a 4096 byte boundary. With the future of large sector disks, this will become even more important. While the best way to evaluate these features would be to compare the VHDX file format with the VHD file format, unfortunately Microsoft has not yet released the VHDX file format. Given that the VHD file format in Windows Server 2008 R2 uses 2MB data blocks, the applet effectively writes at the beginning of the first 2 data blocks. While I plan to analyze the I/Os in more detail, for now, there is one interesting observation. 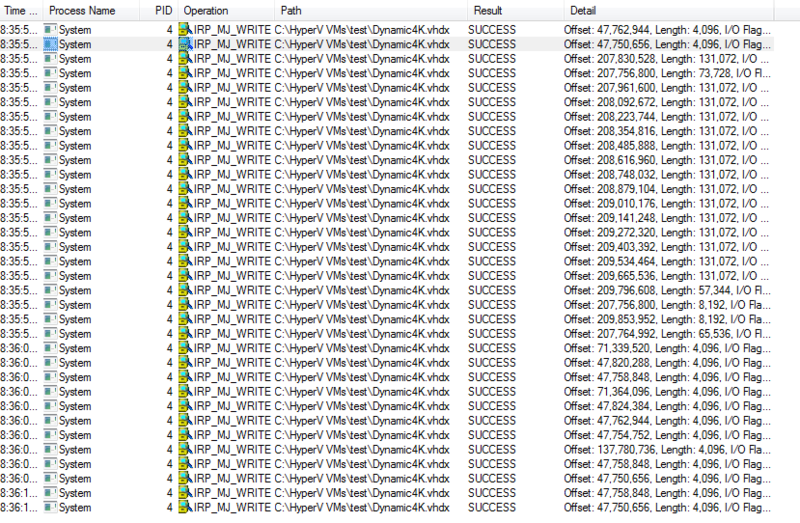 Here are the I/Os on the VHD file traced using Process Monitor in the Windows Server 2008 R2 parent. The immediate observation is that there are some 512 byte writes on the VHD based volume whereas the VHDX based volume shows no 512 byte writes at all. The 512 byte writes are presumably the writes to the Sector bitmap of the VHD (file format). While the conclusion is not definitive, one is drawn to believe that the 512 byte sector bitmap has been replaced and/or moved – maybe the sector bitmaps are now all together and not interspersed between data blocks. More on this topic in a later blog.